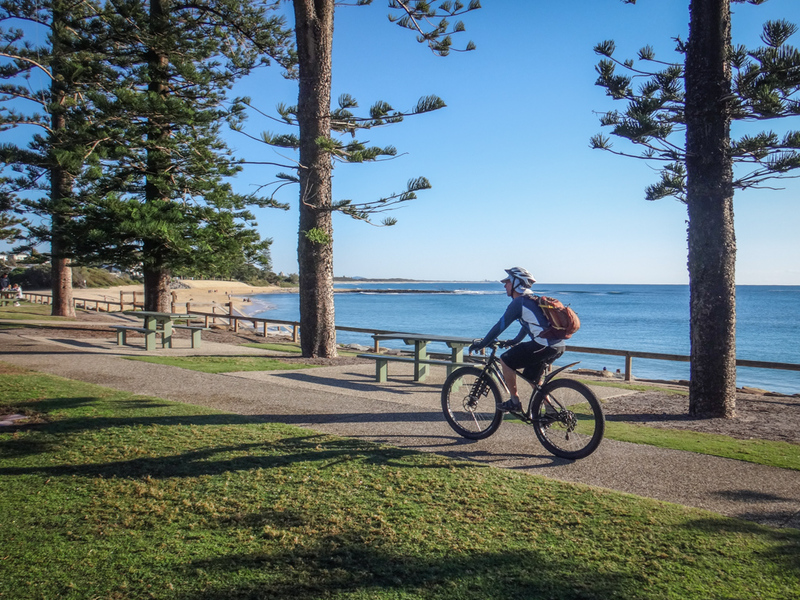 We started at Moffat Beach on the northern shoreline of the Caloundra Headland. While the early morning sun still cast long shadows through the iconic Norfolk Pines, we set off from the car park and rolled onto the sand. 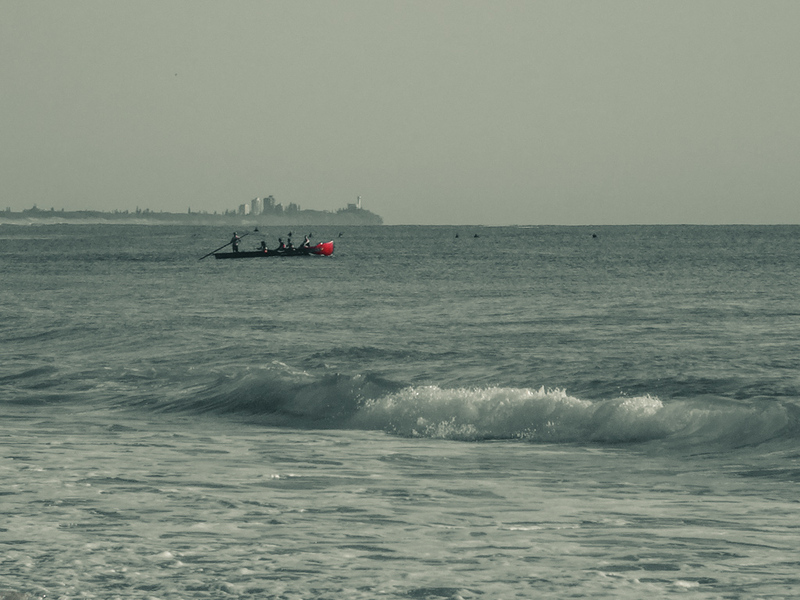 Lifesavers tested their surfboat in the calm morning sea. These impressive row boats are designed to allow a rescue crew safely through rough waves and return back through the break to shore. I think you’d need strong arms and nerves of steel to pilot them in rough weather. 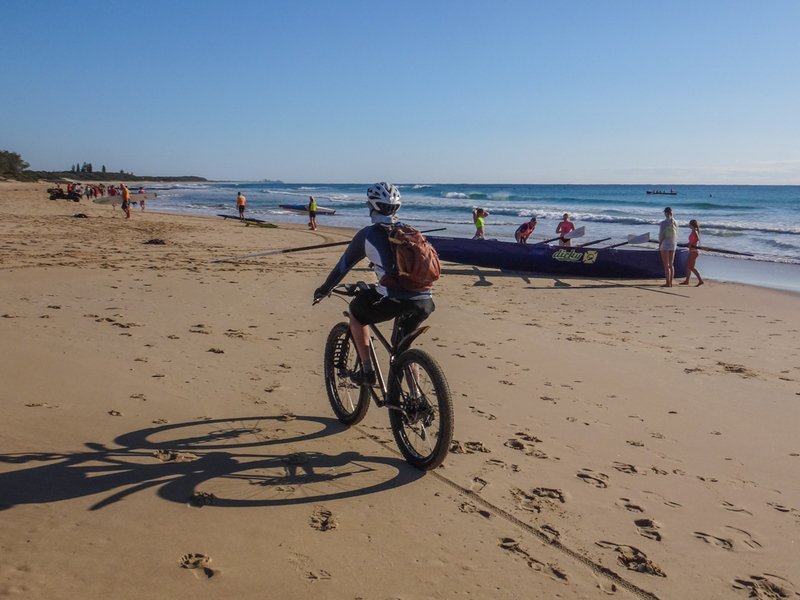 Another surfboat team readied their craft on the beach. 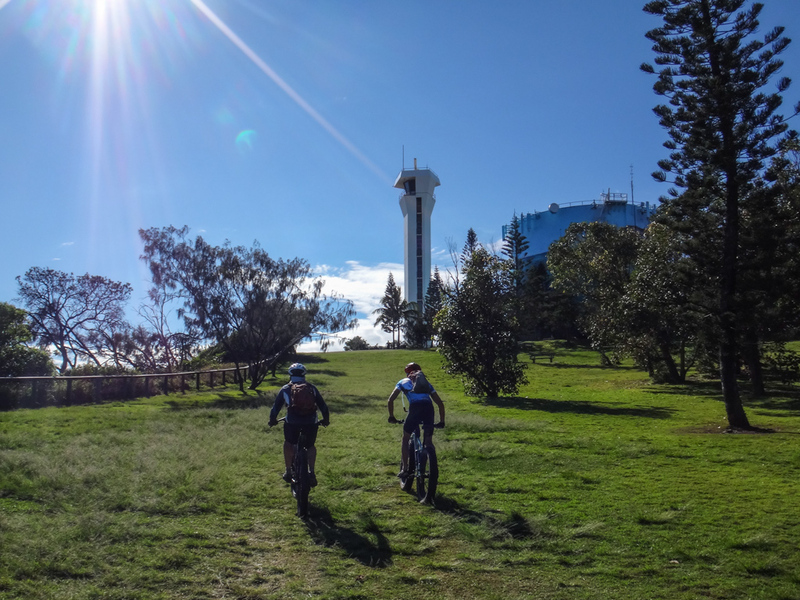 Today’s ride would be relatively short – there was no rush. 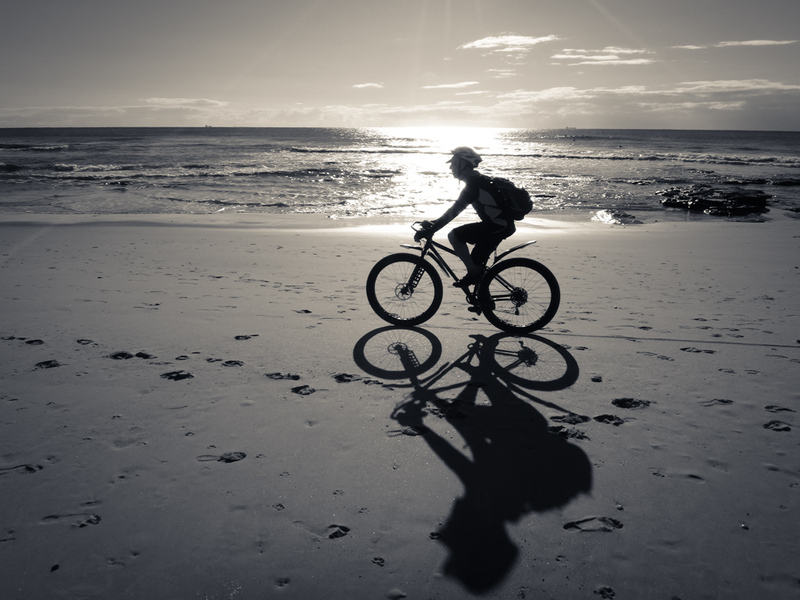 We just took our time as we rode up the beach on the falling tide. At Currimundi Lake, we had to wade through the water. 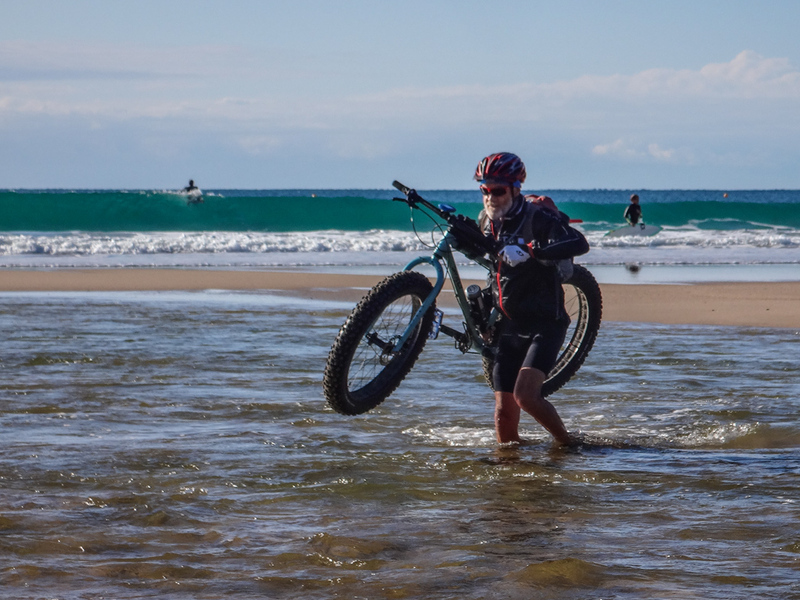 It’s thigh-deep in parts so we carried the bikes as high as we could to avoid getting salt water in the hubs. 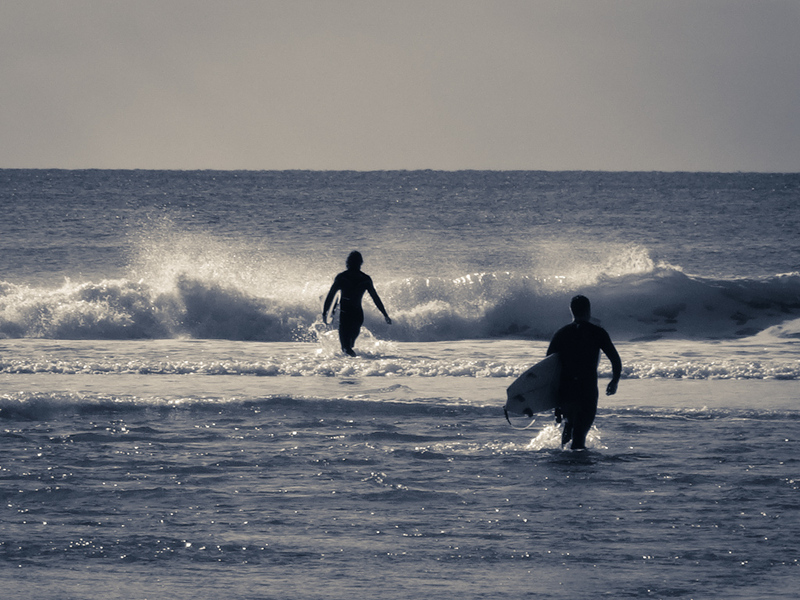 The breeze stiffened and surfers waded out through the warm water to catch waves. Winter doesn’t last long in this part of the world. Eric and I had left without Calum – we didn’t see him at the car park, and he didn’t see us. He eventually caught up with us after some clarification over the phone. When he saw how deep the water was where Eric and I crossed, he decided to try a little further downstream instead. The gamble paid off – he made it look easy! 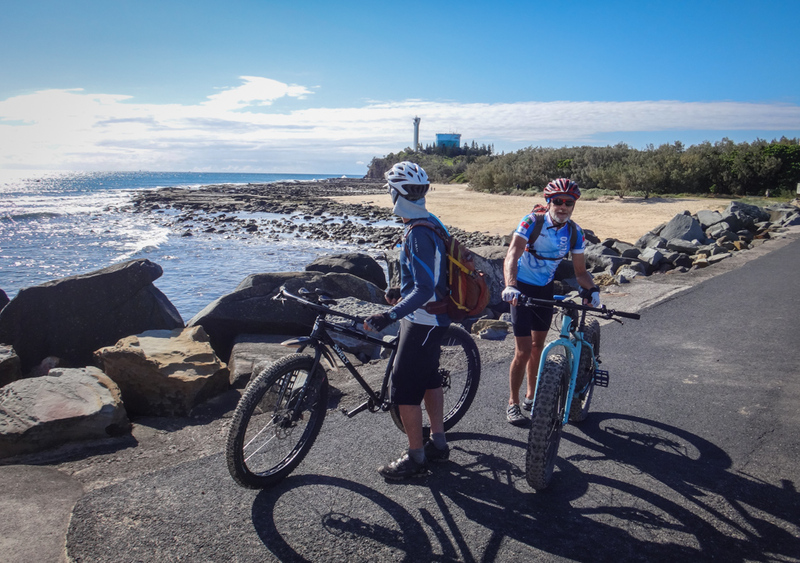 Point Cartwright slowly loomed larger as we rode up the beach, its white lighthouse standing tall on the headland. Except for the occasional walker and their dog, we had the beach to ourselves. 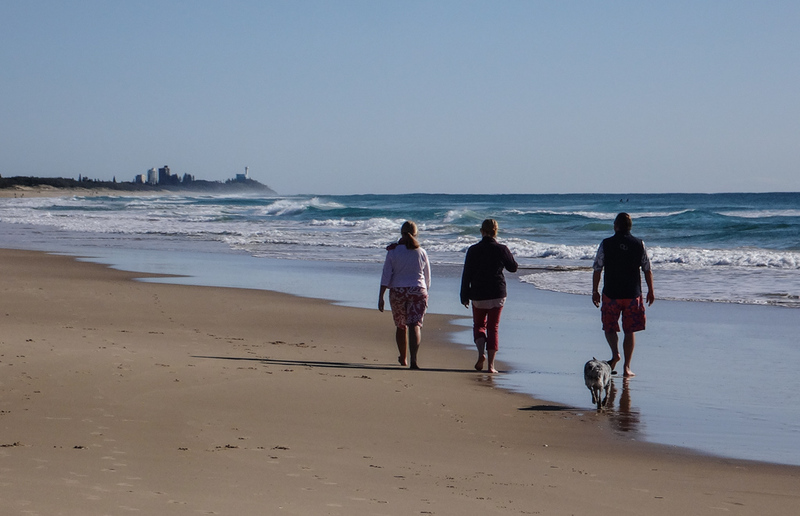 I was surprised how secluded the beach felt, considering how close we were to some of the busier residential parts of the Sunshine Coast. 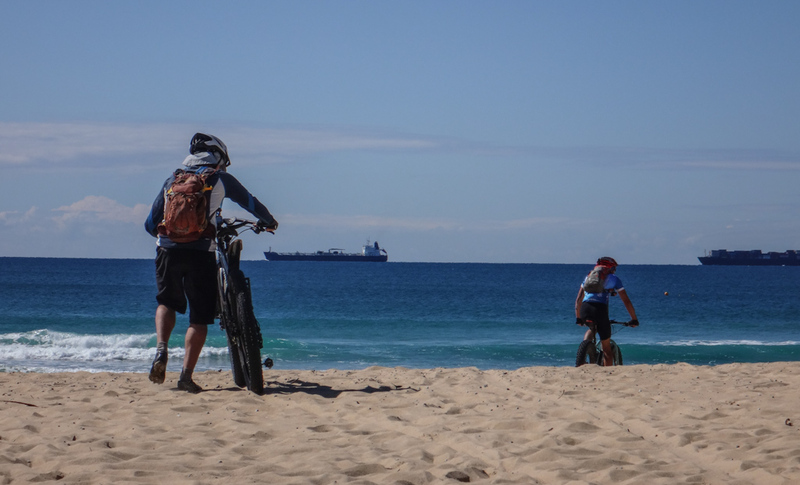 With a slight tailwind and firm sand, this was an effortless ride – we coasted lazily up the beach in the easy conditions. 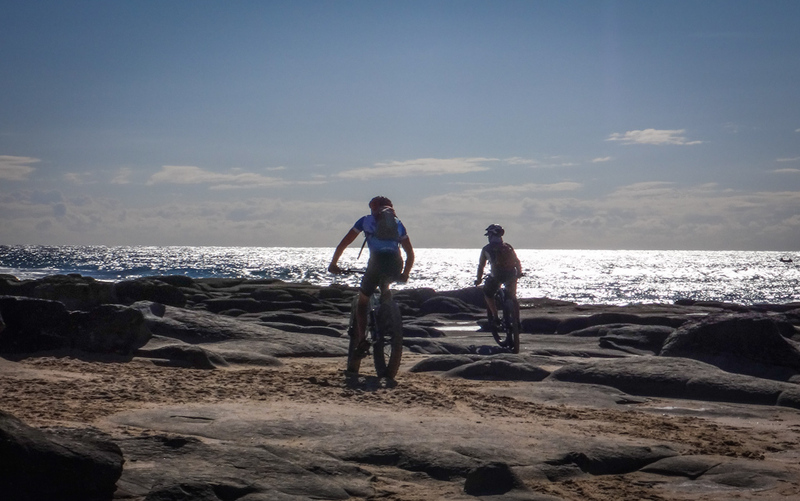 When we arrived at Point Cartwright we had two choices: ride up and over the headland, or go around it. The tide was going out so we decided to ride around the point on the rocks. 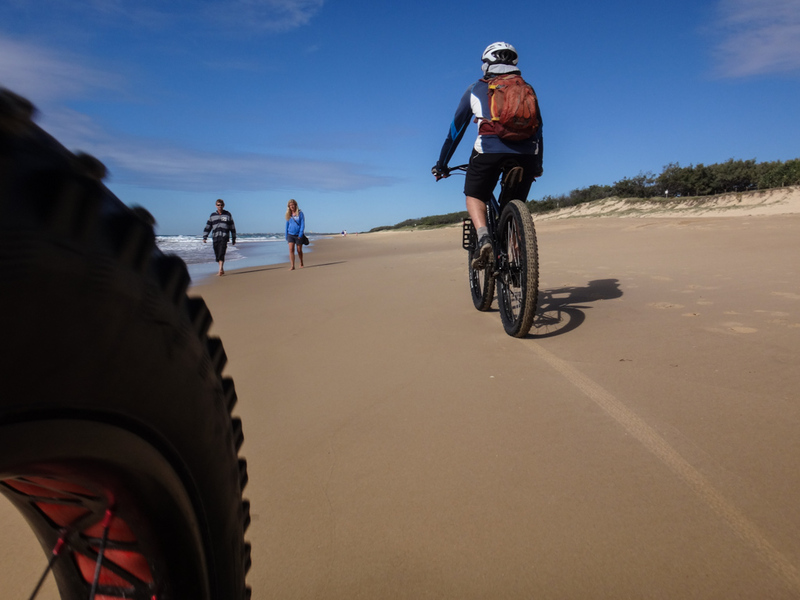 Our tyres gripped the rocks firmly. They were soft enough to soak up the bumps from the rough edges. 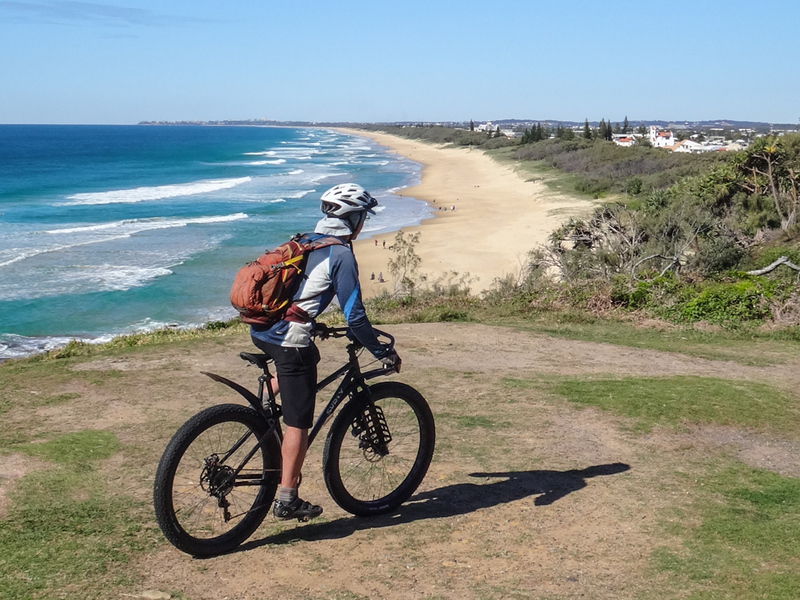 I’d never ridden a fat bike over a rocky headland before – but it handled the conditions perfectly. We had to dismount briefly on the northern tip, under the cliffs. “I’d ride this if I was crazy enough” I muttered to no one in particular. I wasn’t feeling too crazy today. 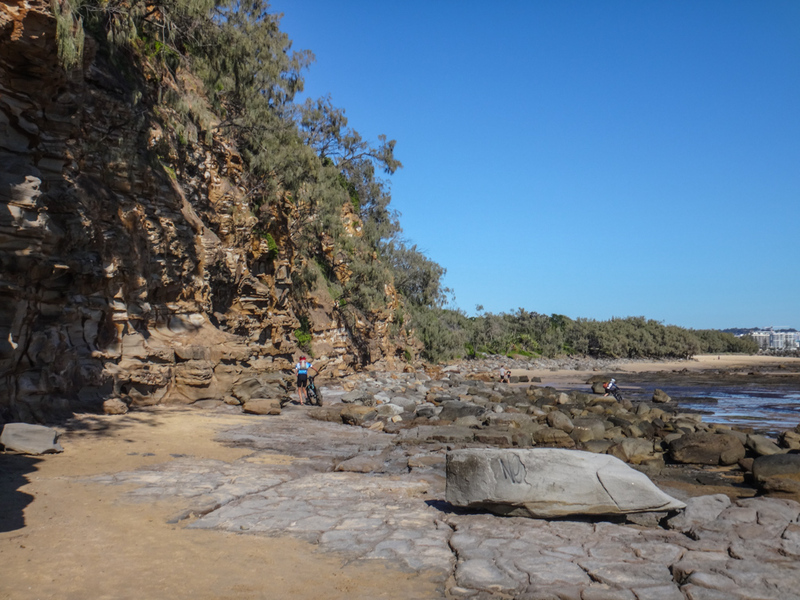 We continued towards the mouth of the Mooloola River, through slimy rock pools while the waves crashed on rocks close by on our right. On the horizon Mount Ninderry and Mount Coolum raised their ancient heads. 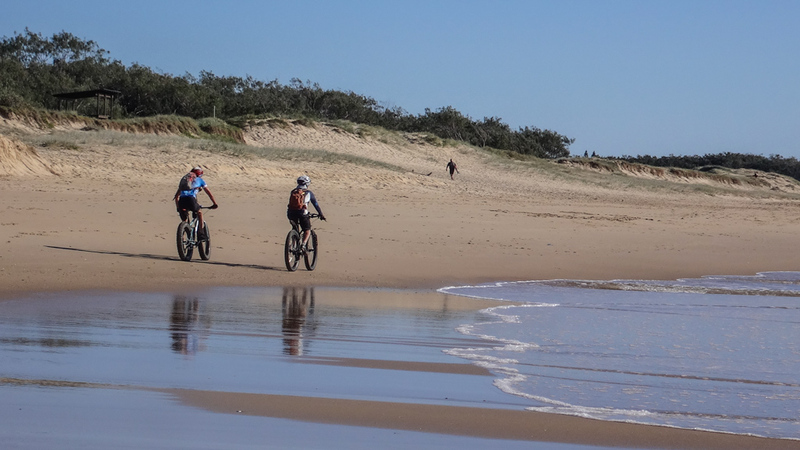 In Kabi legend, Coolum and Maroochy were young lovers. Old man Ninderry was jealous for Maroochy’s love and kidnapped her. Coolum came to her rescue and fought with Ninderry. 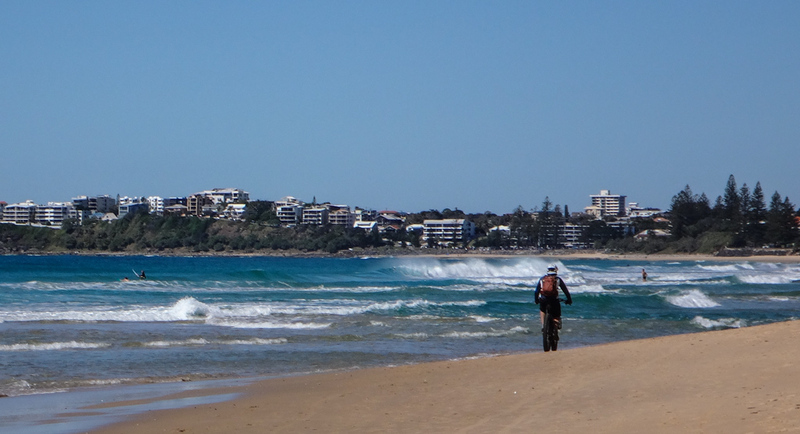 Ninderry killed Coolum, striking off his head, which rolled into the sea and became Mudjimba Island. 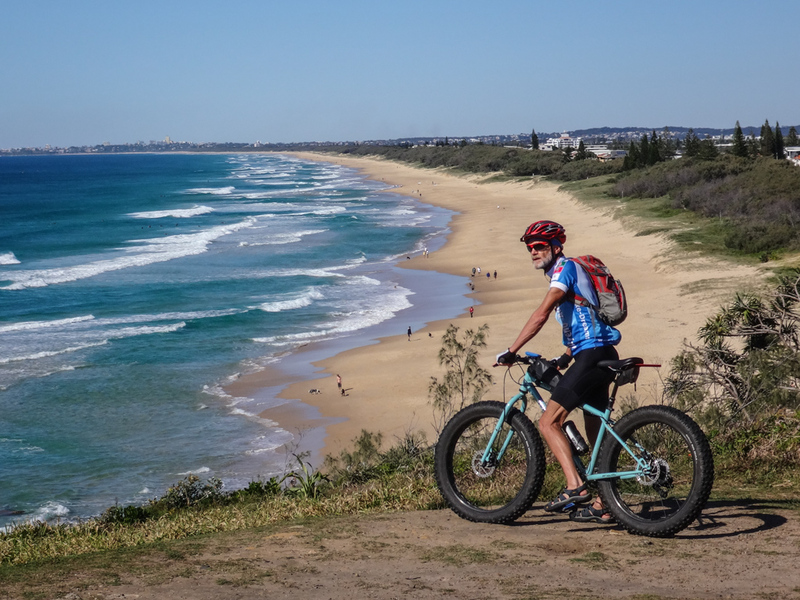 His body became Mount Coolum. The elders were furious with Ninderry and turned him into stone. Maroochy fled into the mountains and wept for her lover Coolum. Her tears became the Maroochy River. She turned into a black swan, many of which can still be seen today on the upper reaches of the Mooloola and Maroochy Rivers. 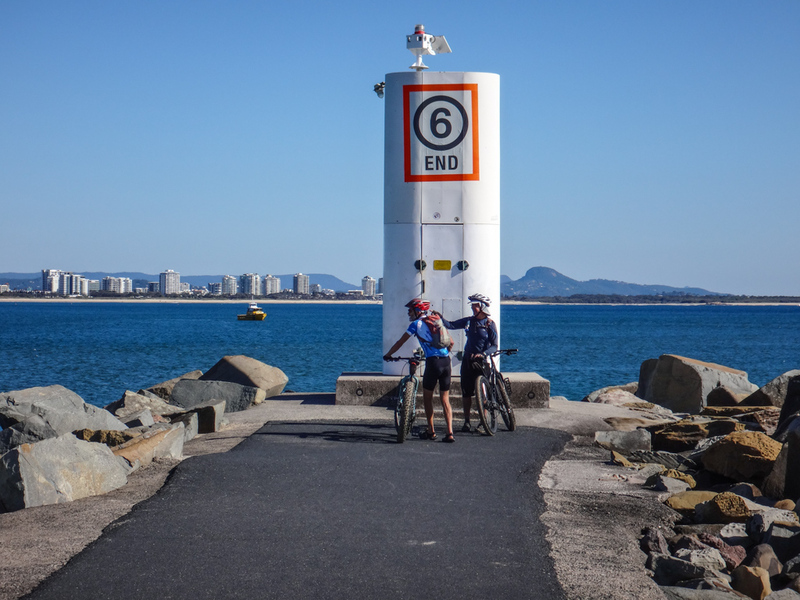 We rode out to the end of the breakwater. On one side the sea wrapped back around the headland. On the other boats busily moved back and forth through the river entrance. This was a colorful spot. 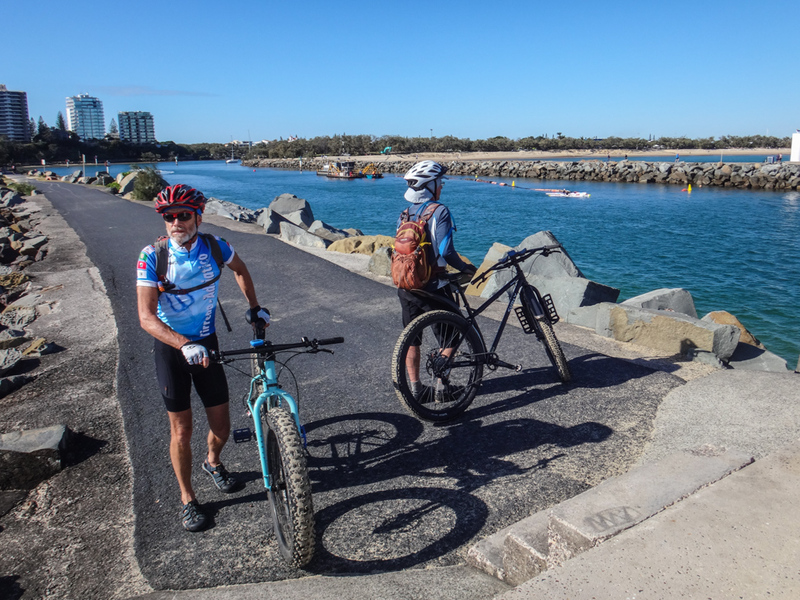 Outriggers, Sea Kayaks, Stand-Up Paddle Boards, Surf Skis: so many fun ways of getting around! We had reached as far as we could today – the river prevented us from proceeding any further. It was time to turn around and head south. Before rolling back down the beach, we climbed up the headland for a better view. 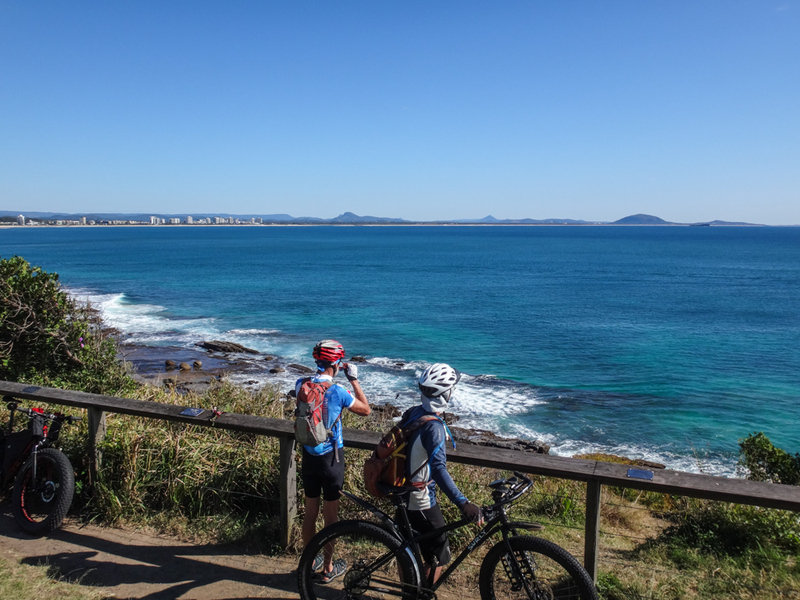 From up here we could see how the bustling town of Mooloolaba sat in the curve of a large bay which curved gently north towards Coolum and Point Arkwright. 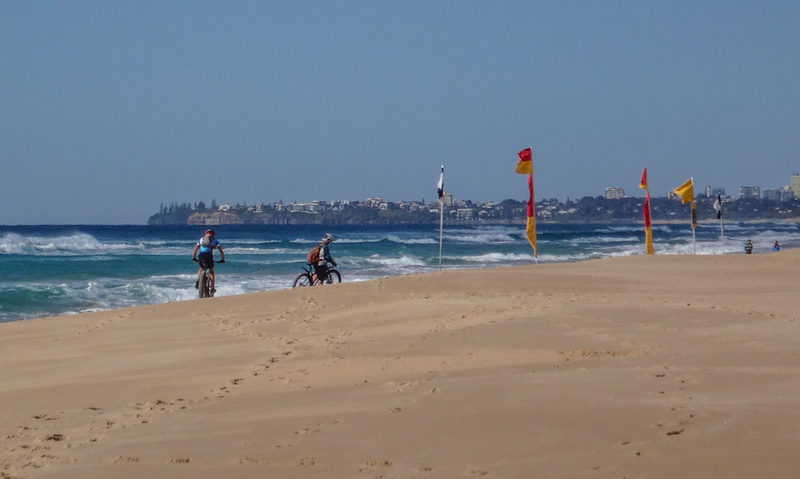 To the south, the wide beach stretched in another gentle arc back towards the Caloundra Headland, showing us where we had ridden this morning. Eastwards the ocean stretched endlessly – a rolling sheet of stunning turquoise, green and blue. We rolled down the headland and back onto the beach. The tide had bottomed out and was now slowly rising, as the south-westerly breeze stiffened in our faces. 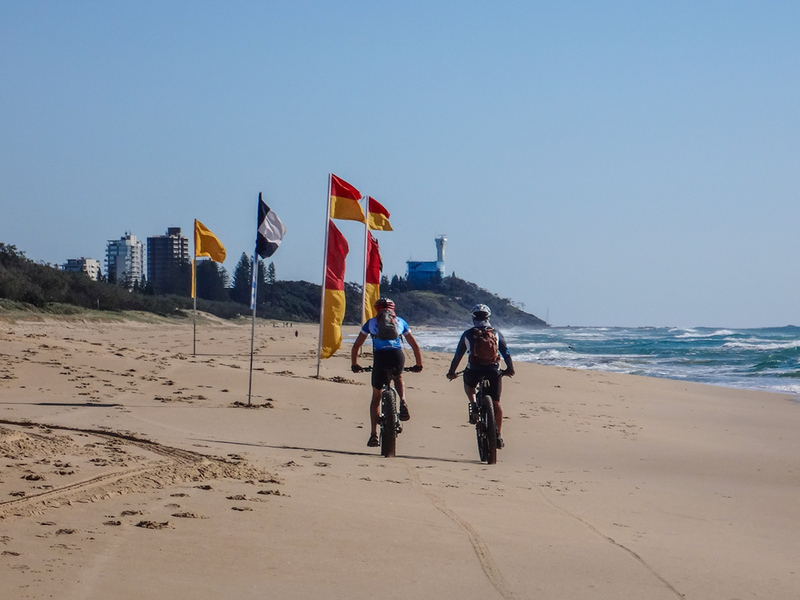 Despite the headwind, we still found it easy going on the firm sand. 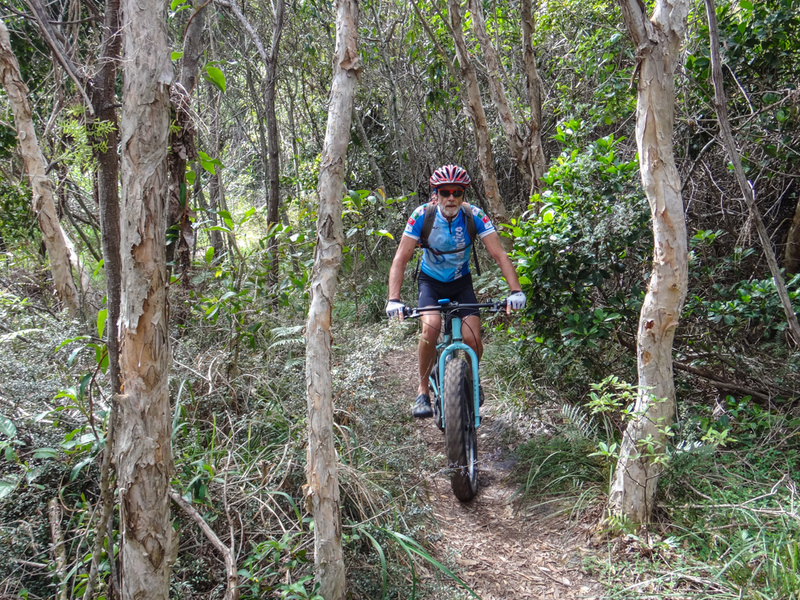 At Currimundi we decided to avoid wading through the water and detoured around the lake via the conservation park instead. 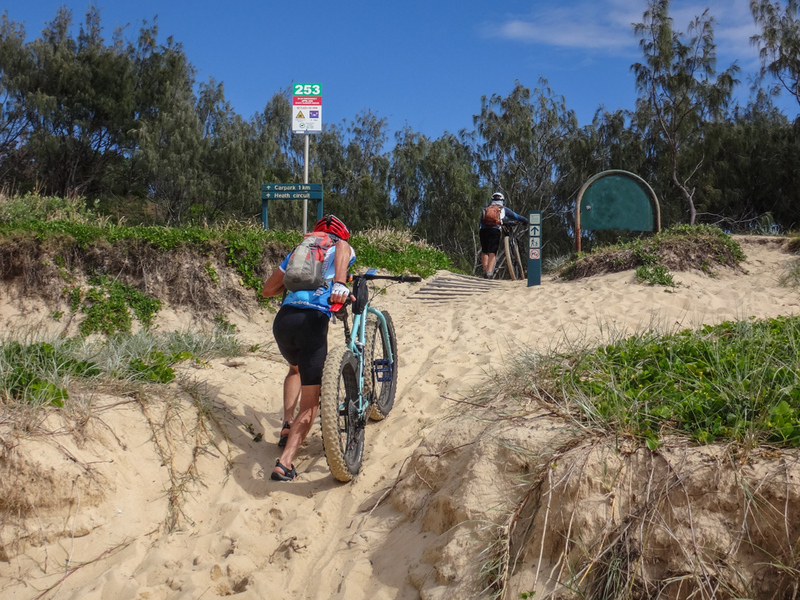 After the broad expanse of the beach it seemed unusual to ride through such narrow twisting tracks. Eric’s bike has 3 inch tyres. 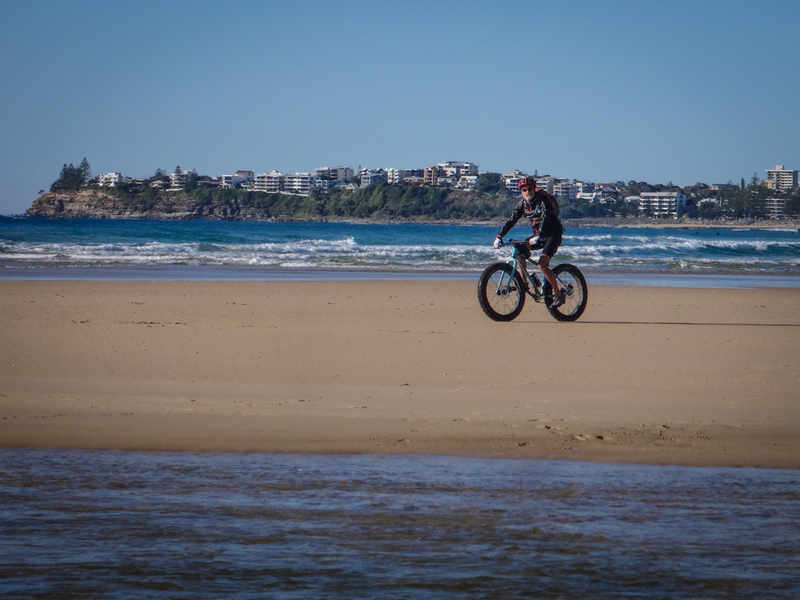 He found it difficult to ride over the soft sand back to the beach, and ended up pushing it for a short distance. Calum’s tyres were slightly larger at 4 inches. This allowed him to drop the pressure and made his tyres softer than Eric’s. He was able to ride uninterrupted over the same stretch of sand. My tyres were 5 inches wide, but I ended up having to walk behind Eric. Perhaps it was because I weighed more than them – or maybe it was my lack of skills. Who knows? We neared Moffat Beach. The sea which was calm as we rode out now grew rougher in the strengthening breeze. Like the horse that smells the stable on the way home, Eric unconsciously increased his pace, leaving Calum and me behind. 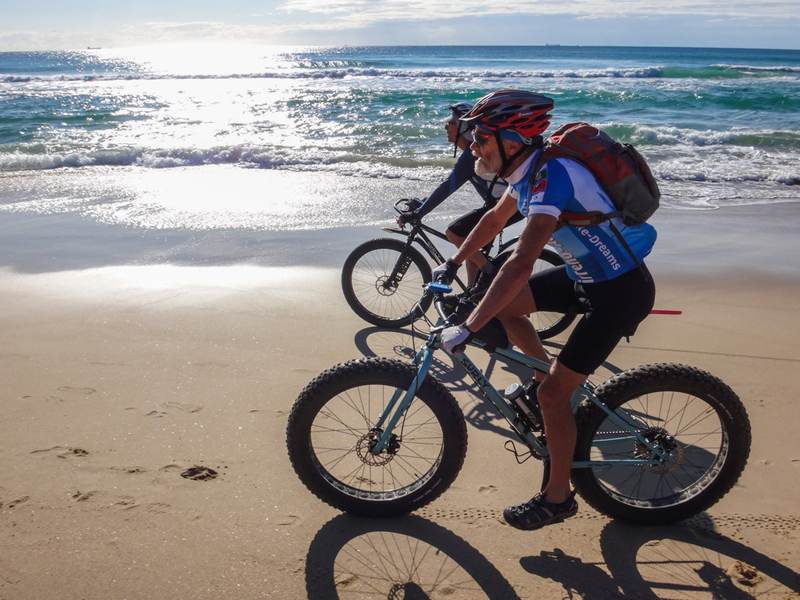 We couldn’t resist a final ride over the last set of rocks on the beach. 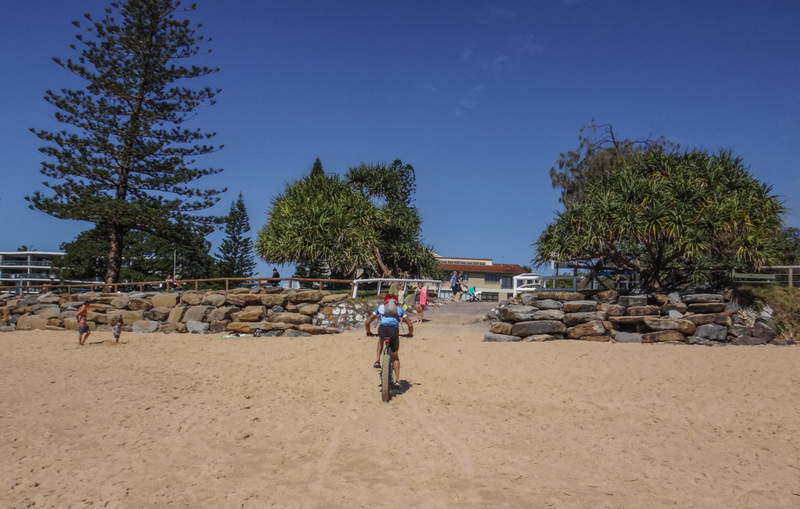 Beach-goers looked on curiously as Calum and I bounced over the boulders as if we were at a BMX park. This was an easy ride – just what I had asked for. We rode 30km in about three hours with about 50 metres of climbing, during which I burned about 1,500 kcal. I’ll rate it 4 out of 10 on the tough-o-meter. You need to be careful on the rock sections, and be aware of the tides. 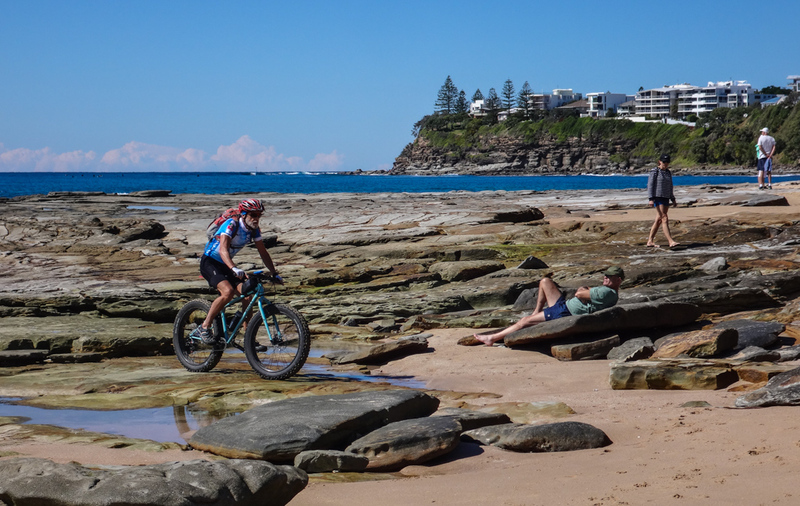 I wouldn’t want to try riding around a rocky headland when the tide was coming in. Thanks Eric and Calum for sharing this ride with me. Looks like a really great day out riding Neil. Fantastic photos! 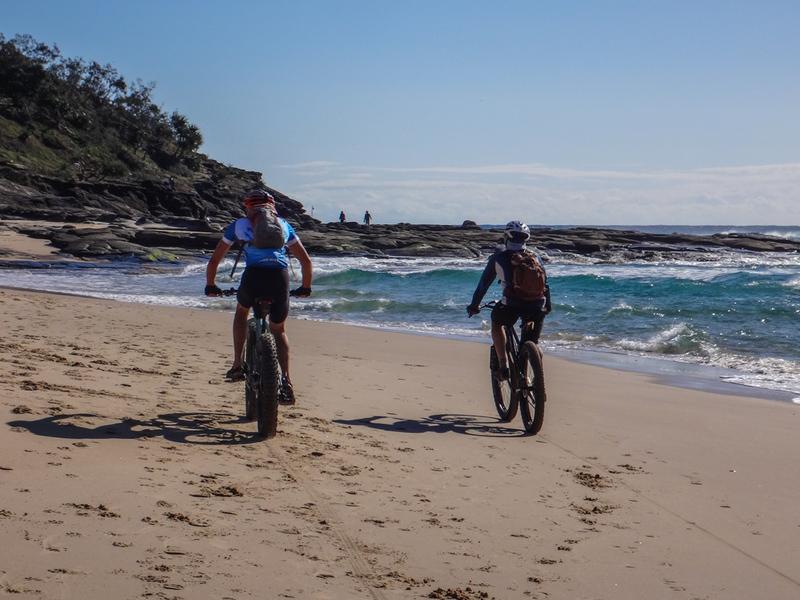 I’ve been to Moffat beach dozens of times since I was a kid, but never ridden up it. I agree with you – it’s a lovely spot. We’re lucky to live here!